We’re having a mini heat wave here in Ohio (above-freezing temps two days in a row). So, since we had help with the boys yesterday, Tom & I finally found time to build a new hay feeder and I’m really proud of our handiwork! I sourced the materials, designed it and marked the wood. Tom cut the wood and set the screws (basically, he built the darn thing). This project was on my fall list, but kept getting pushed back as I took my time figuring out how to make it. I recently decided, however, that it now needed to be a top priority. 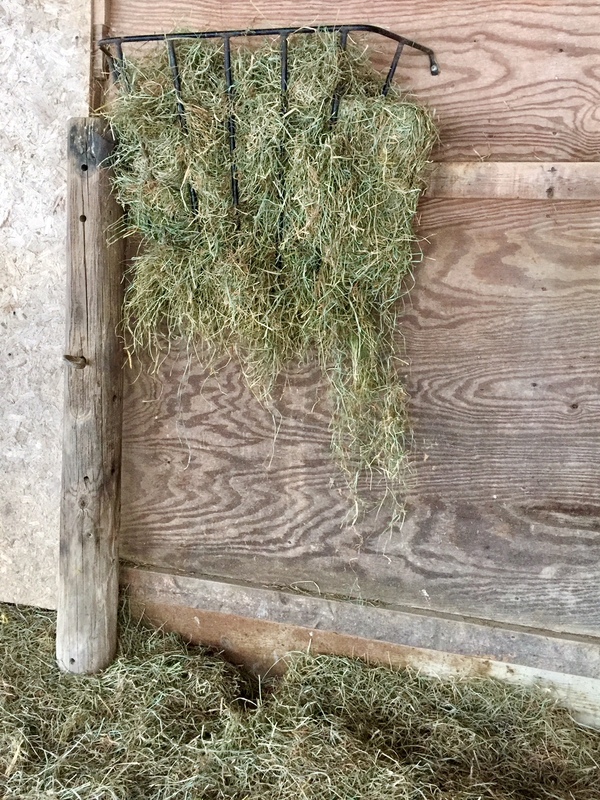 The amount of hay waste from our mounted feeder (previously used by horses) has been more noticeable than ever before, as our fiber boys are eating through 3-4 flakes a day due to all the snow. 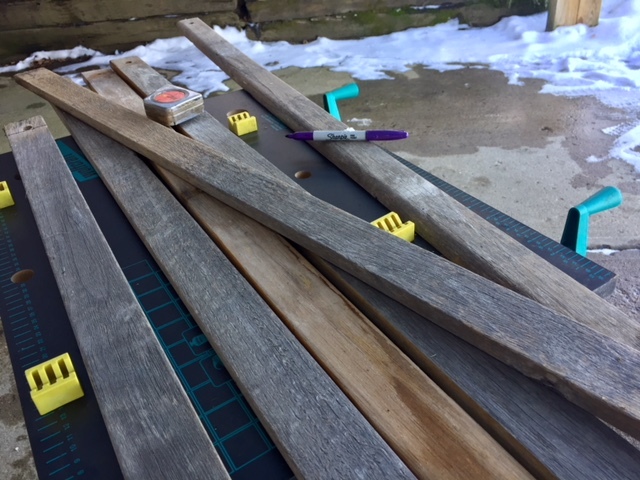 At first I was kicking myself for waiting until winter to build it, but since cabin fever has set in, it ended up being a welcome opportunity to get outside and work. Also, I told Tom it kind of felt like a date – us out there on the patio with music playing, conversing without interruption (sad, I know). Now, I‘ve gotta give props to my friends in the Alpaca Farm Life Facebook group. 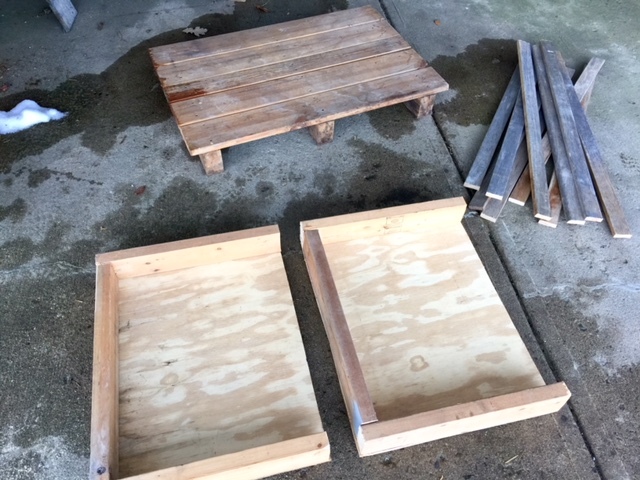 When I asked for DIY hay feeder ideas after bringing our boys home, I got a load of great photos and tips in response. Even though ours ended up being something very different, it was inspired by all of theirs. I also need to thank my dad for some really important advise he gave about the execution of my design. The dimensions are 26” x 39” x 25”. 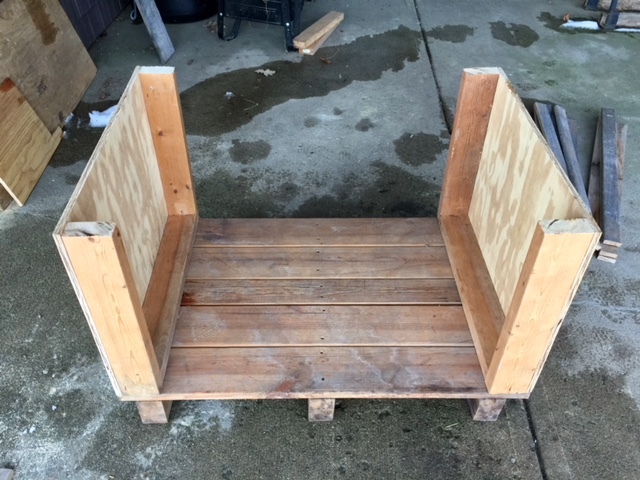 For the base, we used a heavy pallet that my parents gave us this fall when we needed a bunch of them to stack hay on in the barn. I set it aside knowing it deserved something better than a few bales on top! 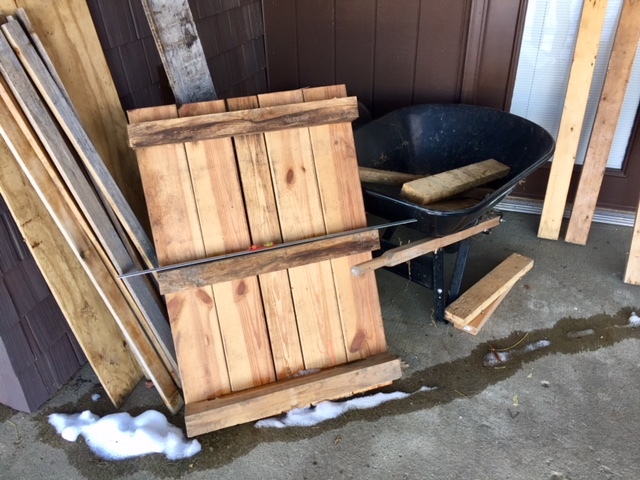 From our wood supply, I pulled 10 slats we kept from a park bench on the property that I disassembled last spring. I had promised to make something cool with them and this project was the perfect thing! After finding a large piece of plywood in the garage and some 2x4s in the barn, I had everything I needed for the design. 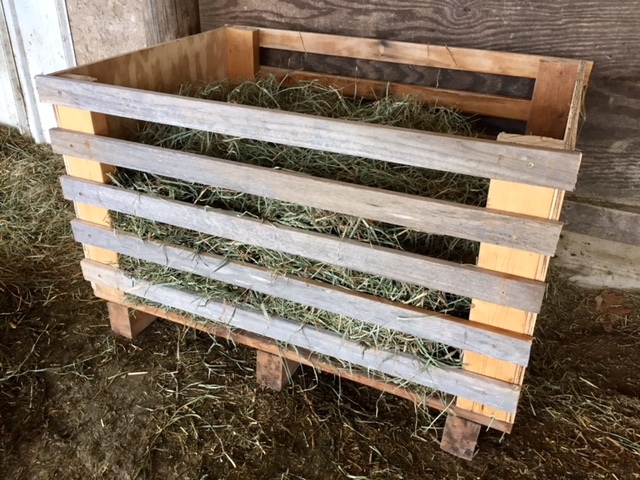 I call it our “park bench and pallet” hay feeder, because I love that we didn’t buy a single piece of wood to build it and instead used stuff we had lying around. I’ve always been one to hold onto random materials & supplies (despite my attempts at living a minimalistic lifestyle) and since moving to the farm, this habit seems to finally have some value! To improve on the design and prevent even more waste, I plan to add some type of free-floating grate to the top, which will move down with gravity as the hay is eaten. It needs to have some weight to it, so that it won’t be easily knocked out of the feeder. Right now my thoughts are to cut a section of cattle panel down to size or to make a grid from a couple of old curtain rods we are no longer using. I hope to figure that out by next weekend and will post an update once I do! It’s exciting to share another small victory! As new fiber farmers, we are constantly learning. If you’re hoping to start a similar business, three things: start small, research research research (this only counts as one thing), and then – DIVE IN! The time may never seem right and there’s no better time than the present, so why not? How Cool Jes! You make it so interesting and sound SO easy! Get out of here!! Ha!! Would love to be living your lifestyle right now, but….can’t turn time back now! LOL! Poor ME! !